It was a day full of upsets with three number one seeds, one number two seeds, ten number three seeds, and six number four seeds suffering defeats along the way to the semifinal round. Even when the seeded wrestlers won, it was often a battle to the last whistle of the bout. The only benefit that I could conclude with being a seeded wrestler in yesterday’s rounds was that it presented a great big target for your hopeful competitors to hit. Being seeded meant you were going to have to earn your place on the podium on Saturday evening if you were going to be fortunate enough to be there. With six mats going simultaneously and nearly every bout having an opportunity for a story, I only had the privilege to witness a handful of these exciting matches firsthand. However, I was fortunate enough to be mat side for the 130 pound quarterfinal round between Kyle Wade (Islip) and Jon Hoeg (Mt. Sinai). In a tournament with many upsets, this was one of many that exemplified that being the seeded wrestler meant you were wearing a great, big, red bull’s eye on your back only visible to your opponents. Jon Hoeg a senior at Mt. Sinai was determined to make his last visit to the Section XI championships a lasting memory. In the third period of this quarterfinal bout, Jon Hoeg holds the lead 3-0. With 30 seconds left in the third period, Kyle Wade scores a TD to tie the bout at 3 apiece putting the bout into OT. In the opening round of the OT match a scramble ensues, the ref awards Jon Hoeg the TD, but there is some discussion at the table as the points may have been secured after time ran out. The officials conclude that time ran out and the match continues into the 2nd OT period with Kyle Wade on bottom. Jon Hoeg rides out Kyle Wade for the duration of the second period with the bout entering the 3rd period tied. Taking bottom to start the 3rd period, Jon Hoeg reverses Kyle Wade with 18 seconds left on the clock and rides him out for the remainder of the period. With an OT win Jon Hoeg faces Dan O’Malley(Sachem East) in the semifinal bout. After the match I asked Jon his strategy going into the match, he said, “I knew he (Kyle Wade) was pretty technical so I wanted to be the first one to shoot on my feet since I knew he was good on his feet, and it worked out for me.” Asked what his thoughts were going into the 3rd period with the score still tied, Jon said, “I thought to myself, I gotta get out. I just kept telling myself I’m gotta get out. It just came down to my heart.” There you have it. It was a day that not only required a lot of talent and rigorous preparation to win, it required equal doses of heart. Heart was displayed all day yesterday among the victorious and the defeated. What a day of wrestling. 96 – This could be a final with two brothers competing for first place. Mike Soria emerges into the Semifinal round defeating first seed Nick Mauriello of Hauppauge 8-2. Mike of Kings Park will face off against Steven Coppola of West Islip. His brother Max Soria faces Corey Rasheed of Longwood. 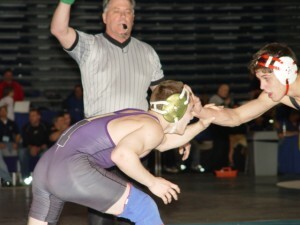 103 – Damon McQueen of Hunting faces Alan Gomez of Central Islip at the top of the bracket. Conner Bass of West Hampton Beach faces Malik Rasheed of Longwood. 112 – Kenneth Collado of Hauppauge, coming off a very tough quarterfinal match, faces Anthony Abidin of Hills East. In the Quarterfinal Kenny defeated Nick Hall 2-0. Kenny scored a takedown in the first period with 2 seconds left. In the bottom half of the bracket Nigel McNeil defeats the 3rd seed Dan Gray 5-4 and faces off Pete Detore of Westhampton Beach. 119 – Steven Keith the one seed from Shoreham-Wading River faces Casey Brice of Longwood. Casey unseeded the forth seed, Jeff Snair of Kings Park, 9-0 to emerge into the semifinal match. In the bottom half of the bracket Matt Gannon wins by decision over the third seed, Nick Ventiere of East Islip, to face Alex Gomez of Brentwood. 125 – Nick Meinsen of John Glenn faces Ryan Gerondel of Sachem North. Ryan emerges into the semifinal bout from the pigtail round and defeats the forth seed Jimmy Russel of Patchogue-Medford. Tyler Senisgalli of John Glenn wins by decision over Adam Troy of Walt Whitman by the score of 2-1. Adam Troy was the third seed at this weight. Tyler will face Andrew Colamussi of Harborfields. 130 – Jon Hoeg of Mt. Sinai faces forth seed Dan O’Malley of Sachem East. At the bottom of the bracket, Omar Santiago of Huntington faces Mike Piro of Sachem North. Omar defeated Travis Calderon of Brentwood to emerge into the semifinal bout. Travis defeated third seed Matt Fusaro of John Glenn 6-5 where his strength riding Fusaro out was the difference in the outcome. 135 – Stephen Dutton of Rocky Point faces Jordan Colon of West Babylon. Stephen is doing what Stephen does, wins with authority. At the bottom of the bracket Travis Pitre defeated the third seed Alex Brown of East Islip 11-2 to emerge into the semifinal round against Edwin Perry of Riverhead. 140 – Nick Terdick of John Glenn faces Louis Esposito of Kings Park. At the bottom half of the bracket Ryan Connell, after defeating the third seed Kevin Panebianco 11-6, faces Andy Rodriguez of Central Islip. 145 – Mike Bosco of John Glenn defeats the one seed Dan Gorman 10-7 to emerge into the semifinal bout against Joe Giaramita of John Glenn. Joe is having an amazing tournament. Emerging from the pigtail round, he defeats the third seed Rich Lugo by a pin in 3:00 and then defeats Anthony Bonaventura of Hauppauge by a pin at 5:34. This kid is on fire pinning his way into the semifinal bout. Jermaine Jacobs of Amityville faces Anthony Volpe of Rocky Point at the bottom of the bracket. 152 – Mike Powers of Mt. Sinai defeats the number one seed Anthony Crivello of Northport 6-0 in the quarterfinal bout to emerge into the semifinals where he will meet forth seed Jon Goulding of William Floyd. At the bottom of the bracket Ryan Rheaume of Riverhead faces Chris Carlucci of John Glenn. 160 – Billy Coggins of Rocky Point faces Chris Delorio of Sachem East. Chris defeated the forth seed Ty Morrison of Copiague by pin at 4:55 to emerge into the semifinal round. At the bottom of the bracket Louis Puca of Huntington defeats the third seed, Rick Nardielli of Northport, 6-5 to emerge into the semifinal round where he will faces the always tough TJ Neidhart of Shoreham-Wading River. 171 – Josue Mendez of Brentwood faces Frank Speights of West Babylon as expected, based on seeding. At the bottom of the bracket William Parks defeats the third seed Sean Heaney of Mattituck 4-3 to emerge into the semifinal bout against Anthony Lupi of Huntington. 189 – Zach Buonanito of Miller Place faces Jake Smith of Smithtown West. Jake emerges into the semifinal bout after defeating Adrian Mack of Baysore by pin at 5:09. At the bottom of the bracket everything goes as expected with Vic Lazares of Hills East facing off against Marvin Titus-Casseus of West Babylon. 215 – Earnest James of Longwood faces Cory Schweitzer of Shoreham-Wading River. At the bottom of the bracket Eric Wooley of Hauppauge faces Kevin Cassiday of Smithtown East. This is one of the few, if maybe only weight, where everything played out as expected. 285 – Sean Walsh of Lindenhurst faces Cody Hinrichs of Islip. At the bottom of the bracket Scott Munro upsets the 2nd seed Andrew Slawson of East Islip by pin at 5:36 to emerge into the semifinals against Ben Lee of Longwood. Ben Lee defeated the third seed John Wilkinson of West Babylon 3-0 to land into the semifinal opportunity. Fantastic announcing by Marty Riccio! I’m a huge fan! Hope to hear lots more in the future…………..